Location: Situated some 300m E of Nanhoron, S of the B4413 road, in a walled garden next to the entrance gates to Nanhoron estate. A C19 estate lodge; the design possibly taken from an architectural pattern book. Rubble stone with a slate roof and central chimney. Cottage of compact L-shape plan; the inner angle has curved arcade of two segmental arches forming a loggia with shallow conical-shaped roof; small inner lobby with ledged doors to right and left. Both gable-ends have tall round-arched recesses with inset mullion and transom windows; lattice glazing with small-pane leaded lights and slate sills. C20 extension to S.
A well-proportioned early C19 estate cottage of a type rare in the region, situated in a prominent position at the entrance to the Nanhoron estate. Situated some 300m E of Nanhoron, set back slightly to S of B4413 road, and forming the entrance to the Nanhoron estate. 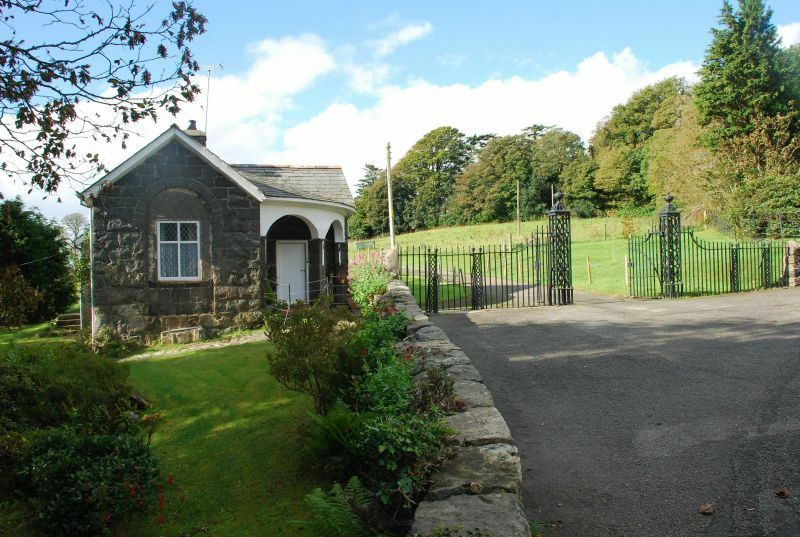 Situated on N side of B4413 some 10m W of junction with B4415 E of Nanhoron near Rhydgaled. In the grounds of an estate, surrounded by parkland to the S and a walled flower and vegetable garden to the N, reached along a private drive which runs some 150m SW of the B4413. Situated on E side of B4415 just N of junction with B4413 at Nanhoron. In the grounds of the estate at Nanhoron reached along a private drive which runs some 150m SW of the B4413 into a partly cobbled yard. Datestone in boundary wall to N of stable reads 'T + I 1756'. Approximately 1.69km E of Botwnnog, reached along a private drive some 150m S from the B4413, surrounded by the estate park to the S and a walled vegetable and flower garden to the N.
Situated in small valley reached by drive running N off road just W of Capel Nant. Situated by bridge over the Horon, just W of B4415, some 400m N of junction with B4413.